Bill and his family are sitting around the kitchen table having a mini board meeting about their now 1 year old polyurethane concrete lifting and leveling business. There are big decisions to be made and Bill, conservative by nature, is securing everyone’s input. Over the winter Bill’s son has voiced increased dissatisfaction with his current job. He has been campaigning for Bill to expand the market of his business and to add another unit. Currently the business has no debt and Bill is comfortable where things are. An economy where confidence is allowing homeowners and companies to invest in their homes and plants. He has a trained and trustworthy future partner ready and anxious to jump in. Like every GOOD business person Bill knows his numbers. He had a very successful and very profitable launch in his 2018 season and is appropriately anxious about risk. Toward the end of 2018 Bill and his son followed the HMI marketing template and began doing more demonstrations for DOT’s and road engineers. He is hopeful they will yield some ROI in the coming season. Bill accepted a call from a local farmer on the rural edge of his market area. The farmer noted that one his friends from the county suggested he call Bill. The farmer further explained that due to flooding and other problems over the winter, one his grain silos had sunk over 12 inches on one side and was now tilted. The farmer further offered that he had an engineer evaluate the problem and that they actually did soil borings around the silo identifying weak areas and found water as deep as 2 feet under the silo slab. Bill was excited but a little intimidated by the opportunity. He has no experience dealing with engineer reports and has never attacked a project of this scope. However, he sees the Profit Opportunity and decided to call his HMI account manager. Jason, his account manager at HMI, listened to Bill’s story and referenced similar past projects HMI has supported other customers with. These were other grain silo projects that mirrored Bill’s opportunity. Jason noted the DeepFoamjection process that Bill had only been reading about as applicable in this case. That same day, HMI was in contact with the farmers engineer on behalf of Bill. Tech data sheets were supplied to the engineer. HMI’s chemist also interfaced on Bill’s behalf and provided independent testing data on the characteristics of HMI’s Hydrophobic foams. The next day Jason worked with Bill to prepare a proposal for the project which was north of $150k. Bill’s anxiety was increasing. 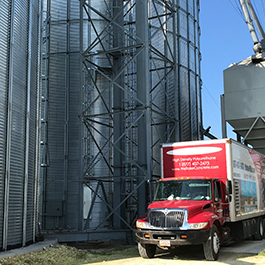 The Silo Project funded the purchase of a second unit for Bills business. His son is now working full time with Dad and they have expanded their market area by 100%. Two other Silo projects surfaced immediately as the word got out about Bills capability. AUTHORS NOTE – The characters and events in this blog are fictitious. Any similarity to real persons is NO coincidence and absolutely intentional by the author. Watch for more about Bill In future blogs as he and his family grapple and hurdle the administrative challenges of a fast growing business.